I had never heard of farro until I ran into it in a dish at Pizzaiolo last summer (luckily, my foodie dining companion was able to fill me in on what it was.) After seeing farro featured in two tasty-sounding blog posts by Heidi at 101 Cookbooks and Susan at FoodBlogga this summer, my interest was finally piqued enough to buy a bag of the stuff and try it on my own. Despite the hefty price tag ($6.99 for a 1lb bag) I was pleasantly surprised by the results! Farro's nutty taste and chewy texture make it both satisfying and delicious. I was also impressed by how easy it was to prepare -- I bought the semipearled kind which does not require soaking and cooks in 15-20 minutes on the stovetop. I was in a bit of a rush so I made a pretty simple salad by cooking the farro in vegetable broth, then tossing the drained grains with chopped parsley, chives, walnut oil, sea salt and freshly ground pepper. Major yum! While farro was completely new to me, it turns out to be a very ancient grain. Also known as emmer wheat, farro is believed to have been domesticated in Turkey and, along with barley, was the dominant crop of the ancient Near East. Grains of domesticated farro have been found at an archeological site in Syria that dates back to 11,500 BC and wild grains have been found at sites in Israel dating back as far as 17,000 BC. It appears that farro cultivation declined largely because it is a relatively low-yield crop. But it has had a resurgence recently, especially in Italy where its cultivation is well-established and continuing to expand. After eating it, I can completely understand why it's making a comeback. I encourage you to give this ancient grain a try! 2. 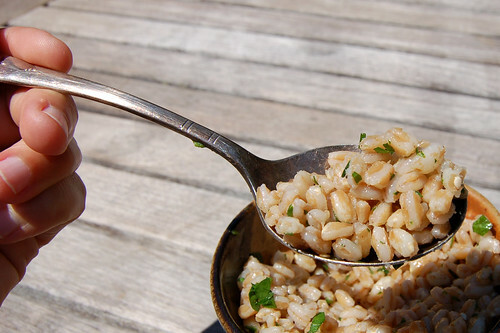 Drain the farro and place the grains in a bowl. 3. Wash and dry the herbs, then mince and add to the bowl of farro. 4. Toss with the walnut oil until combined and season to taste with the sea salt and black pepper. This farro salad is equally good warm or cold the next day so you could make this ahead of time. Farro seems quite versatile. Some of the ideas that I think sound good include adding chopped tomato (or sun dried tomatoes), basil and olive oil for a hearty Italian-style salad, searing or roasting fresh asparagus and leeks and mixing them with feta and olive oil for a spring salad, grilling or roasting eggplant, tomatoes, pepper and onions and tossing them with herbs and oil for a summer harvest salad, and tossing a handful of farro into a soup instead of barley or rice to boost its heartiness factor. I've also pasted links below to three farro recipes that I thought sounded really good. 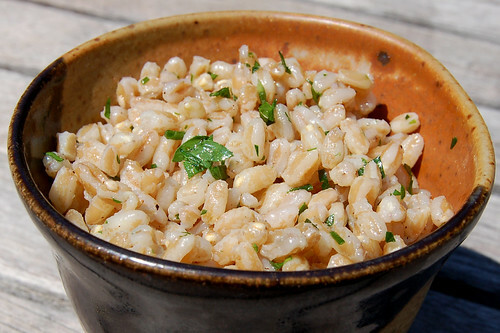 And if you have a great farro recipe, please submit it via comments so we can give it a shot. Thanks for the link! I'll have to look for that semipearled type. 15-20 min. is pretty quick indeed. I know it does have gluten in it (since it is a kind of wheat) but that it has signifantly less than conventional wheat.) I believe it also has a good deal of fiber and protein. Here's what Whole Foods had to say: Farro is an unhybridized grain belonging to the wheat family. It is rich in fiber, magnesium, and vitamins A, B, C and E, and is easily digested into the system as energizing carbohydrates. 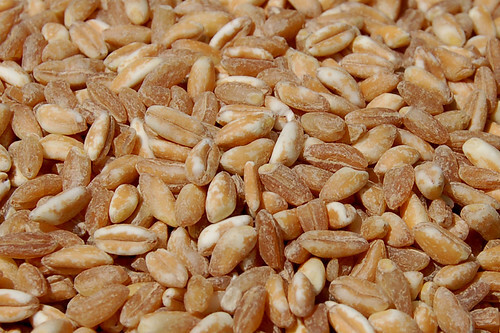 Many people who are wheat sensitive can eat farro due to its low gluten content. Farro is a close cousin to spelt, a more readily available ancient grain.